The history of Old Saint Joseph’s Church is one characterized by tolerance, service, and flexibility. The oldest catholic congregation in the city, the church has strived to serve its community, no matter of what form that “community” may take. Throughout out its long history, the neighborhoods surrounding the church and its parishioners have changed enormously, shifting from servicing some of the most prominent members of Philadelphia society to the “poorest of …the poor,” and back again. Throughout the church’s many years, its intentions to serve the community have not faltered. 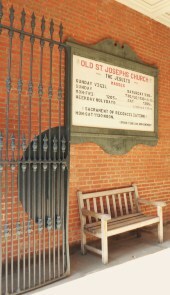 Old Saint Joseph’s began in 1729 when an English Jesuit priest came to Philadelphia from Maryland in search of the religious freedom garunteed under William Penn’s Charter of Privileges. A chapel was built for the Catholic congregation in 1733. 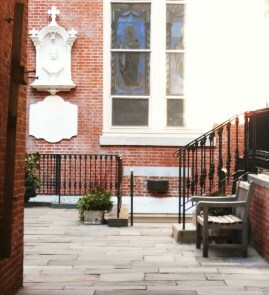 As the Catholic community of Philadelphia grew, the original church was enlarged and an additional congregation (St. Mary’s) was built by 1763. The priests of the parish aided the victims of the Yellow Fever epidemic of 1793 which took the lives of 4,000 Philadelphians (1/10 of the city’s population.) The devastation of the fever left the city with many orphaned children, an issue that the leaders of Old Saint Joseph’s addressed by establishing the first Catholic orphanage in the city. Old Saint Joseph’s opened its doors to those people, both black and white, seeking refuge in Philadelphia after the 1791-1793 Revolution in Santo Domingo, establishing a continuing legacy of acceptance and diversity. The church baptized slaves before emancipation, had pews rented by black families, and operated St. Mary’s Charity School which educated black children in the early 1800s. In 1859 a larger school solely for the education of black children was created, later becoming St. Peter Claver’s Church and School in the 1880s. The church that stands today was built in response to the return of the Society of Jesus to the church in 1839 on the same site as the original 1757 structure. Funds were raised from city- wide door to door solicitations. The new structure was designed by parishioner John Darragh. The new building was praised for its elaborate ornamentation, but it was not the décor that garnered newspaper coverage so much as the installation of gas light fixtures. In the 1840s, the immigrant population of the city soared. A meeting was held at St. Joseph’s by many prominent Catholic leaders in the city to determine how the church could best address the needs of the immigrants. The meeting resulted in the establishment of St. Joseph’s Society for the Relief of Irish Immigrants, St. Joseph’s Hospital, a new church building and college. The new building was constructed at 17th and Stiles Streets. That new church now operates as the Church of Gesu, and the college as St. Joseph’s Preparatory School. It was after all of this construction that the church on the original site became known as “Old” Saint Joseph’s. The establishment of the college began the church’s integral role in education in the city. By the 1850s, there were four parochial schools (two of which accepted students free of charge,) a night school for working adults, a private school for women, and a Sunday school. A secondary school was established in 1851. From the original college built above the clergy house, St. Joseph’s University and St. Joseph’s Preparatory School evolved. In response to the 1852 Nativist Riots, the Diocesan Board of Education was established, leading to a decree that parochial schools be opened in each parish of the city. As the neighborhood of Old Saint Joseph’s Church became increasingly commercial, parishioners migrated to the outskirts of the city and suburbs to the west. A gift was given by Francis A. Drexel, father of St. Katharine Drexel, to the church for lavish renovations in 1886. In response to the lessening population of the eastern parts of the city, the church expanded its ministries, and reached out to the workers of the Delaware River front. A Sanatorium was built in Fairhaven, Pennsylvania to treat patients with Tuberculosis. The growing numbers of Irish Policemen were served by the League of the Sacred Heart of Catholic Policemen, Firemen and Park Guards, which operated until World War II, gaining fame for a Mass at Logan Square in 1925 which attracted a reported 70,000 people. By the 1900s, the area surrounding the parish had deteriorated into slums. In the 1950s, efforts were made to revitalize the older neighborhoods of the city after suburbanization had left them in a state of disrepair. 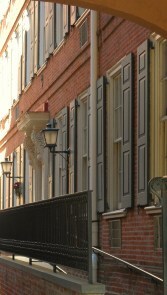 The establishment of Independence National Historical Park, efforts made on behalf of the Philadelphia Redevelopment Authority resulted in a revival of the neighborhood and of the recognition of Old Saint Joseph’s role in the city. The first scholarly study of the church was published in 1953, and the site was surveyed by the National Park Service in 1956. The area immediately surrounding the church was reconfigured, allowing the church to become visible to passersby and fill the sanctuary with sunlight. The interior of the church was also revitalized, and the church archives were established. In honor of the nation’s Bicentennial, a consortium of historic religious structures throughout the city that attribute their creation to Penn’s Charter of Privileges, was established as Old Philadelphia Congregations. In order to further ensure the future of the church, the OSJ Historic Preservation Corporation began in 1992. The church required urgent architectural attention in 2001 when the wooden trusses of the church were replaced. While the church’s history was appreciated and preserved, the parish’s roots in service were not forgotten. Even as the Society Hill neighborhood became increasingly affluent, the church continued to hold a myriad of outreach programs directed towards the poor and homeless. Father Dennis M. Linehan, S.J. 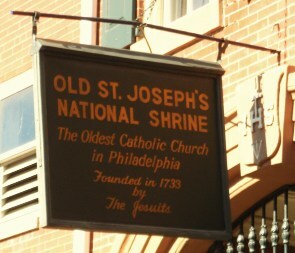 of Old St. Joseph’s stresses that “The parish, today, is very aware of its history” and that “[its] local community is made up of the parishioners, and those served by them and the parish.” The parish continues to serve those in need, operating programs across the realms of health, spirituality, hunger, education, and general well being. According to the church sacristan and parishioner, Chuck Burke, one the church’s most prominent ministries “is the lunch program which serves between fifty and sixty low income/homeless men three days a week.” The program is run by volunteers from within the parish, as well as other participating organizations. St. Joseph’s parish has endured almost 300 years, now defined not by geographic boundaries but by its parishioners, ensuring a continuing legacy of diversity and service to the residents of Philadelphia. A special thanks is extended on behalf of the author to the members of the Old St. Joseph's community who contributed this story.